One beautiful winter day, I had some time to kill in Austin. Of course I headed to Book People. I stood in the mystery aisle, browsing backs of books and making notes on future reads. This list proved to be problematic, though, as I had just finished Tana French’s The Likeness and there was nothing in the entirety of Book People that compared. This is not Book People’s fault: it’s a gigantic, awesomely diverse bookstore: go there! I personally spend hours there every time I get to go. That’s normal, right? But I tell you this to explain to you how much I fell in love with The Likeness. When I finished, I couldn’t bear the thought of reading anything else. So what did I do? I went over to the “F”s and read the back of The Likeness again for comfort. “Is that one good?” a woman next to me asked. She had no idea what she was getting herself into. I turned to her and began gushing over this book (it wasn’t pretty). Anyway she grabbed a copy and headed right to the checkout line, which is what I recommend you do too, right away. So Cassie Maddox transfers out of the Dublin Murder Squad and into Domestic Abuse, a place where she can work with live victims who have a chance at justice. But then she gets a call from the old squad. They’ve found a dead body out in the woods, and here’s the catch: the body looks just like her. Identical in every way. But the victim, a woman named Lexie Madison, lives (lived) in a house with four other graduate students who think Lexie is missing. Some quick police work shows that they are lying: one of them killed Lexie Madison. But so far the police have no idea which housemate did it, and what the motive is. Since they’ve got a dead ringer (pun intended) for Lexie in Cassie, and since Lexie could have been saved with quick medical intervention, the Dublin Murder Squad takes a chance and decides to rewrite this narrative. The new story is that Lexie *did* find help right away, and what a stroke of luck: she pulled through. Now she’s returning to the home she shares with four friends, one of whom wants to see her dead. So now Lexie’s doppelgänger Detective Cassie Maddox is going undercover as Lexie, and soon she is sucked into the crazy world of these five graduate students. The killer thinks he/she was not successful the first time: how long until the next attempt on Lexie/Cassie’s life? 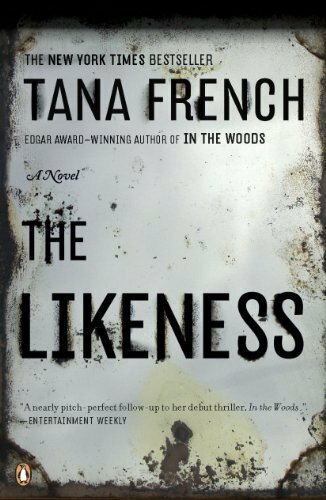 It’s a brilliant concept, and Tana French writes it magnificently. I was stunned on about every page. I loved reading the Irish spin on the dialogue, I loved her poetic imagery, I loved the central mystery (genius), and I loved the character of Cassie. I think you will too.